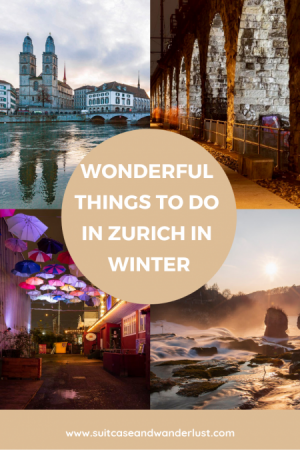 If you’re planning a weekend in Zurich in winter you should not only pack warm but also look forward to hanging out in countless nice cafés and restaurants. Switzerland is famous for its quality, not only in chocolate and watches but also in food. These are my best things to do in Zurich in winter including restaurant recommendations. Walking through the city you will inevitably pass the most beautiful sights and top Zurich tourist attractions. The Lindenhof is a small park on a hill from which you have a beautiful view of the Limmatquai (Limmat is the river) and the old town of Zurich behind it. 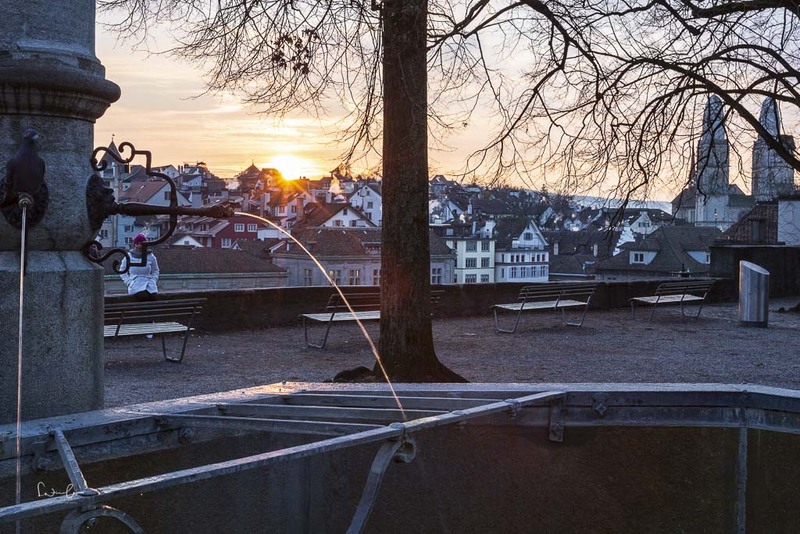 If you like to get up early, you can watch and enjoy a beautiful sunrise from Lindenhof and spend some minutes by yourself without any crowds. If you continue walking from Lindenhof down the small winding lanes, you will reach the Münster Bridge. There you will find a landmark of Zurich, the Fraumünster Church with its famous stained glass windows by Marc Chagall and Augusto Giacometti. On the opposite side of the church, you cross the Münster Bridge to reach the next landmark of the city, the Grossmünster. The two towers of the church are visible from afar. Climbing the Karlsturm is one of the top things to do in Zurich. Via 187 steps you have a wonderful view over the city. If you walk along the Limmat in the evening, I recommend a stop at La Rôtisserie (Weinplatz 2). The restaurant is situated directly by the river with a wonderful view of the Grossmünster and the Münster bridge. A glass of Prosecco outside at the promenade by candlelight wrapped in a fluffy blanket – how does this sound? If you continue walking along the Limmatquai for a couple of minutes, you will reach the Quay Bridge and Lake Zurich – one of the most beautiful sights and must see in Zurich. Have a seat on a bench, take a deep breath and just enjoy the view. From the Quai Bridge, pass Bellevue Platz, walk up the street and reach the Kunsthaus Zürich. In recent years, Zurich has become one of the best cities in Europe for art lovers. The Kunsthaus is not only perfect for art lovers, but for everyone who enjoys strolling through a museum with beautiful works of art. Chagall is also exhibited here – I saw his works in the Albertina in Vienna and was thrilled. Art has its price, admission to the Kunsthaus is quite pricey at CHF 23 (exhibition price). From the Kunsthaus, you walk into the old town with its narrow alleys, many small boutiques, cafés and restaurants. If you like to see beautiful things, take your time for this walk – you might stick to countless shop windows. Do you like guidebooks, too? I have countless guidebooks in my bookshelves just because of the feel of them. Here’s Only in Zurich with unique things and locations. A trip to Zurich West should be on your list of places to visit in Zurich. The area around Escher-Wyss-Platz and Hardturm is a former industrial district that has turned into a trendy and gastronomic spot in recent years. A 500-meter long viaduct arch offers space for a market hall and countless boutiques, design shops and pubs. Freitag sell their world-famous truck tarpaulin bags in a creative container shop and restaurants such as Mrs. Gerold’s Garden or Gerold Chuchi are now known beyond the city. 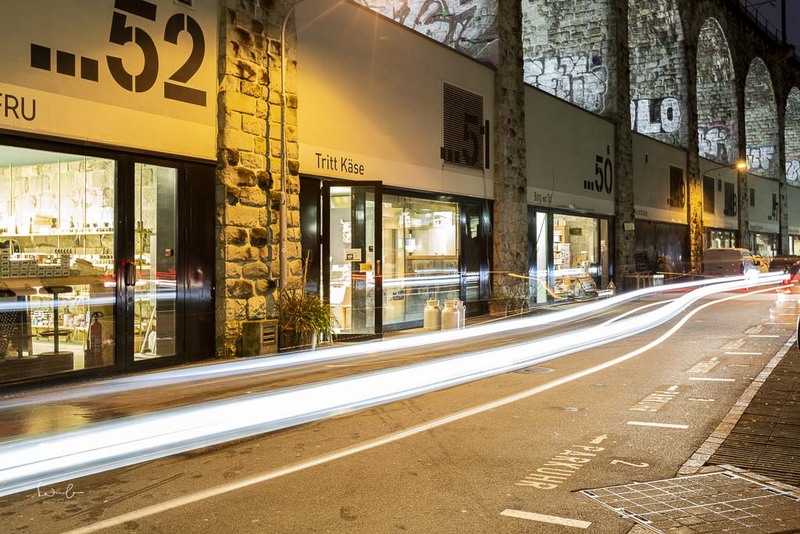 The Museum of Design is another highlight in this area and one of the top attractions in Zurich. Currently, an exhibition of my great idol Sebastião Salgado with his fantastic black and white photos is running. I am a huge fan of waterfalls and natural spectacles. One of them can be found in the surroundings of Zurich, the Rhine Falls near Schaffhausen. In a comfortable hour train ride you reach the station Neuhausen-Rheinfall, from where you arrive at the waterfall in only two minutes. I was there in the late afternoon and could admire the huge masses of water at sunset. Over the bridge, you get to Schloss Laufen, from where you can walk along the Belvedere Trail or admire the waterfall from spectacular viewing platforms. Admission 5 CHF. From the Bürkliplatz jetty in Zurich, take a boat trip to Rapperswil, a nice village with a long wooden bridge that leads to Pfäffikon. In winter the operation is a bit limited with only one trip at 1.30 pm. As an alternative for your day trip from Zurich to Rapperswil, you can take the train to Rapperswill and the boat back to Zurich – or vice versa. Yeah, I know – it’s on every tourist guide and it’s nothing new. But it is more the experience, the feeling and the ambiance of the café: no chic, but worn leather furniture, old marble tables and crystal chandeliers, plus coffee from Julius Meinl, transport Viennese coffee house culture to Zurich. Although the croissant is handmade, it’s not the best I’ve ever had. But that’s not what the Odeon Café is about. Jazz music on Sunday morning while watching the noble gentlemen going in and out, the older gentlemen reading the newspaper alone at the bar and enjoying their espresso. “A good day starts with coffee and ends with champagne. Or vice versa. Agreed. In Zurich West, I recommend the Sphères in Hardturmstraße 66, a cool café with a bookshop where you can hang out for hours. The Kantorei in the old town invites you to brunch every Saturday and Sunday. The restaurant is cozy, the menu huge so that everyone will find something for sure. At Kasernenstraße 77A near the main railway station, you will find a real Italian restaurant with excellent cuisine and good wines. As everywhere in Zurich, reservations are a must. Looking for food and a free seat I found what I was looking for at Jack & Jo. Also here, no chance without reservation. I found one free spot at the bar where I could enjoy my delicious burger. The restaurant stands for Slow Fast Food and serves burgers, bowls, salads – everything with high-quality ingredients. The Prosciutto in AuGust is a dream, the restaurant a meat lovers heaven. The black and white tiles give the modern restaurant a rustic touch. For those of you who love Vietnamese cuisine reserve a table at Saigon. The restaurant is among the top 3 Vietnamese in Zurich TripAdvisor – for a good reason. The glutamate-free food and the ambiance are recommendable. I’m far from a vegetarian. But for the vegetarian food of tibits, I might even convert. The tartare is simply amazing, the guacamole exquisite and the salads are so delicious. The temperatures in winter can be quite challenging, especially when you’re as frosty as I am. I had to wear multiple layers to keep me warm. The public transport network is extremely good. Within the city, you can get everywhere by tram and bus and the airport is also perfectly connected to the public. Within the city, zone 110 is valid. A single ticket costs CHF 3.10, a day pass CHF 13, strip tickets with 6 trips cost CHF 23. For excursions around Zurich you can get there quickly and easily by train and around Lake Zurich, you can take a boat. The B2 Boutique Hotel* has a fantastic wine library, is located close to the city center and even has a spa. If you prefer to stay in an apartment, I can recommend Vision Apartments*. Very centrally located, small and fine, with fitness room and washing facilities. Here’s your hotel guide for Zurich for all budgets. 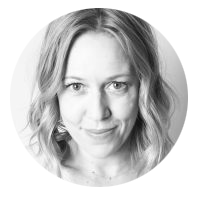 A few very nice girls from the MAC Cosmetics Team Switzerland made me want to explore Zurich in summer when life takes place on the Limmat and the river becomes the city’s absolute hot spot. Zurich, I’ll be back. Disclaimer: This article contains affiliate links marked with *. It means I will get a small commission if you book/buy via my link. This is at no extra cost for you. What glorious pictures of Zurich! Terrific ideas for spending time in this amazing city in the wintertime. Eating fondue outside in a big fur coat provided by a restaurant is always a big hit in Switzerland in the winter. Love your beautiful post. Thanks for sharing!